Voters in Armenia must go back to the polls on 5 March after a presidential election this week failed to produce an outright winner. The incumbent, Robert Kocharyan, who has led this tiny former Soviet republic in the Caucasus mountains for five years, was confident of a win in the first round. No-one was more surprised than he was when the final result showed him failing by just 0.2% to reach the 50% required to avoid a second round. 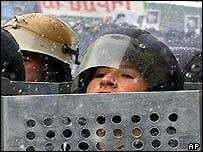 He now faces the leading opposition candidate, Stepan Demirchyan, whose father, Karen, led Soviet Armenia for 14 years. 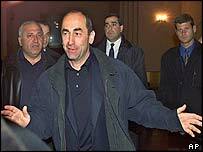 The elder Mr Demirchyan was one of eight people killed in a massacre in parliament in 1999. The younger Mr Demirchyan won 28.3% of the vote in the first round, when he was one of eight opposition challengers. As the results were announced, thousands of opposition supporters rallied in the capital, Yerevan, claiming the vote had been rigged in the incumbent's favour. Officials at the Central Election Commission bolted their doors against the protesters, fearing a repeat of a 1996 election, when riot police were summoned to disperse angry crowds - several people were killed and dozens more were injured. The head of an international observer mission to Armenia has said there were a number of significant shortcomings in Wednesday's vote. "The counting process was flawed and the long-term election process fell short of international standards in several key respects," said Peter Eicher, who led the Organisation for Security and Co-operation in Europe mission to Armenia. He spoke of a pre-election period marred by intimidation and manipulation, including a serious incidence of violence, in which an opposition campaign manager was stabbed. Mher Shakhgeldyan, a political scientist based in Yerevan, told the BBC that the government had taken the allegations of irregularities very seriously. "This is the most likely reason the vote has gone to a second round," he said. "We are keen to join the European Union, and therefore our image as a just nation with transparent elections is very important." Since the collapse of the Soviet Union, Armenia - the first country to take Christianity as its state religion - has struggled with democracy. Once dubbed the Soviet Silicon Valley because of its high-tech industries, the country is now one of the most impoverished in the region. Factories stand empty and in recent years about a third of the population has left the country to work abroad. Tina, a secretary in the capital, Yerevan, said she had voted against all the candidates in the first round. "But next time I think I will vote for Mr Demirchyan," she told the BBC. "People are sick of the Kocharyan regime, and now we have the chance to change it."